Roast the ears of corn over a hot grill, or on the stove top. You can remove the husks, or keep them on, it doesn't matter. Roast them over high heat for about 15 minutes or so, turning every once in a while, until they start to steam and char. Put them aside to cool, just enough to handle. Mix the Mexican cream with the juice of 2 limes. Stir well and taste. If you like, you can add more lime juice for more of a citrus kick. If the mixture is too thick to drizzle, add a touch of water. When the corn is cool enough to handle, remove the husks, if necessary, and slice the kernels off with a sharp knife. Arrange the rocket in a wide shallow salad bowl. Scatter the warm corn over the top of greens, then crumble the cheese over the corn. Scatter the cilantro over all, and then drizzle with the crema dressing. Garnish with a sprinkle of chile powder, and serve with wedges of lime. 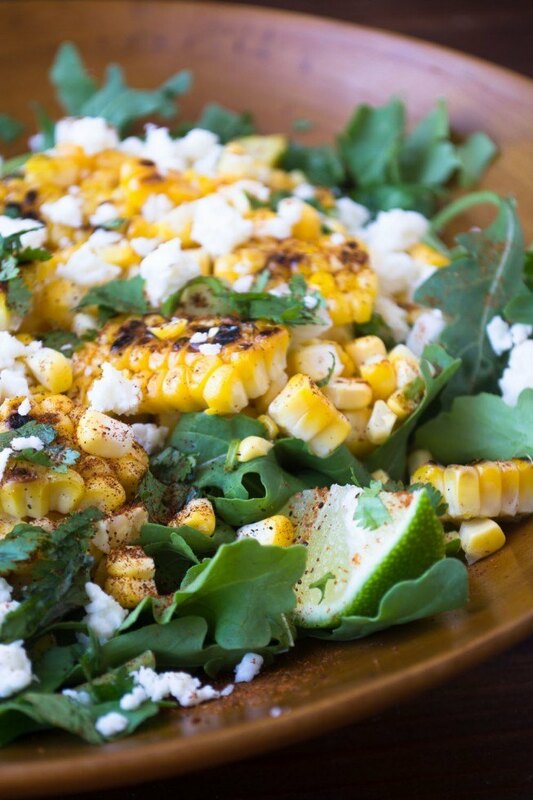 Enjoy immediately because the warm corn will eventually wilt the arugula. If you want to make this slightly more ahead of time, chill the corn before adding it to the salad.